Tabula Italiae Antiquae Geographica Quam Excellentissimus Dominus Dux de la Rochefou Cauld in oere incidi curavit. A large and dramatic 1764 J. B. B. 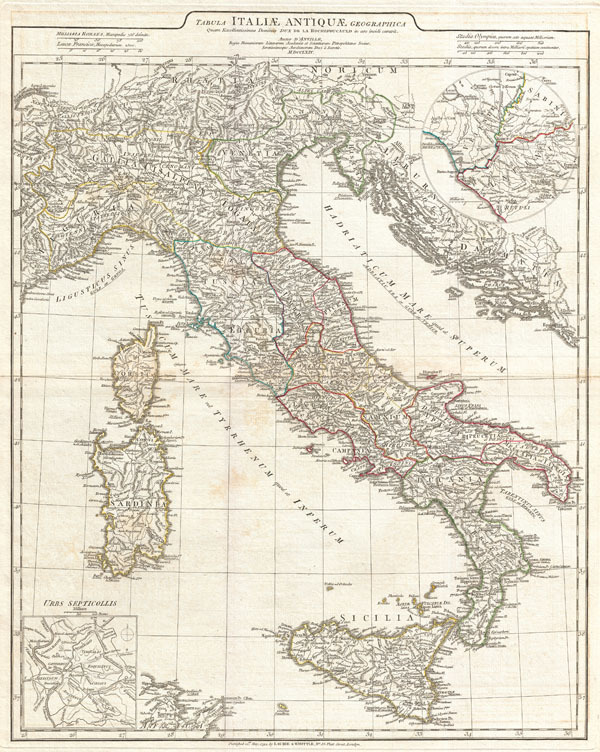 D'Anville map of Italy in ancient Roman times. Covers from Lake Geneva (Lemanus Lac) to Sicily (Sicilia), inclusive of the entire Italian peninsula, Sardinia, Corsica, Sicily, and Dalmatia. Details mountains rivers, cities, roadways, and lakes with political divisions highlighted in outline color. An inset in the upper right details the vicinity of Rome. Another inset in the lower left offers a city plan of Rome. Title are appears in a framed zone above the map proper. Includes four distance scales referencing various measurement systems common in antiquity. Text in Latin and English. Drawn by J. B. B. D'Anville in 1764 and published in 1795 by Laurie and Whittle, London.